Calling all animal lovers! Come and take part in our amazing face to face lemur encounter. In this incredible experience you will get to meet our extremely curious, friendly and interactive lemurs. Prepare to be climbed on and clambered across – our lemurs love to meet new people and get hands on! Our meet the lemurs experience can be purchased for yourself, for a loved one or friend. 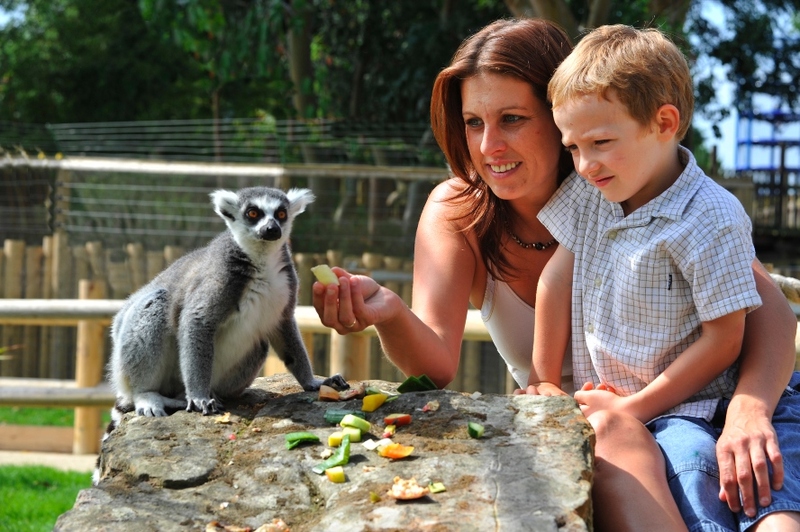 A lemur experience would make the perfect present for any animal lover! The lemur encounter is an amazing one-to-one experience (we also have an option for two participants) which will leave you with memories that you’ll talk about for years to come. The lemur experience involves hanging out with these inquisitive and very friendly animals. You will prepare their favourite snacks and then head inside the enclosure to feed them. You will have a Zoo Keeper dedicated to you so you can unravel their knowledge about the lemur’s cheeky behaviour and naughty habits. If you are lucky enough, you may get a selfie with these sociable animals as they get up close and personal during your lemur experience. Admission into the zoo for the participant. Lemur food preparations in our Zoo Kitchen. The chance to feed our lemurs. One-on-one time with a Zoo Keeper to ask any questions you may have. The opportunity for some close up lemur photography. You will receive an Animal Encounter certificate at the end of your lemur encounter. Entry to the Park is included for the lemur encounter participant(s). Additional (non-participating) guests will require a valid day ticket. In the case of two participants the cost of the second participant is half price (two participants must be the same group or family, and booked at the same time). For more detailed information and to book one of our Close Encounters, please see here. Annual members get 10% off! To check availability for our lemur experience please call the Park on 01323 874100, email us at [email protected] or you can come and visit us in the Visitor Services Office opposite the Park Entrance. We regret that we are unable to make provisional bookings or take bookings over the phone.